Geek 101: What Is Arduino? Waiting rooms are really boring, and the year’s worth of Sports Illustrated or Time Magazine back issues can only last so long. How are geeks supposed to keep themselves amused? 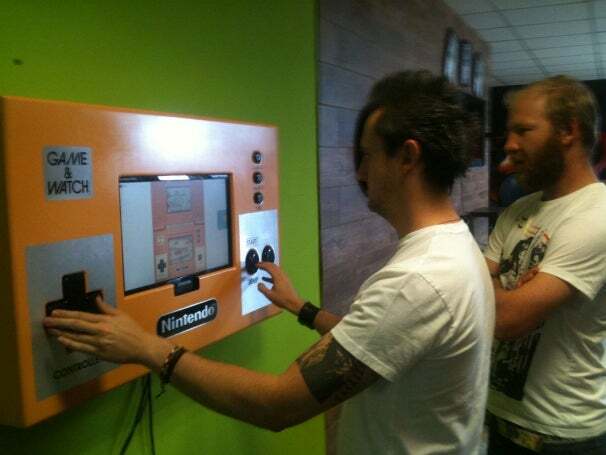 How does a massive wall-mounted Game Boy sound? The folks from 21tanks, a creative outfit based in Olivedale, South Africa, were talking with Tobie Nortje of House 4 Hacking. 21tanks wanted something to spruce up its reception area, and the discussion eventually led the idea of having an HDTV that anyone could use to play retro games while they waited. Luckily, Nortje knows a little something about wiring together a faux Nintendo using Arduino. So he set up an old monitor into a Game Boy-like housing with an oversized D-Pad and two buttons. The controls are wired to an Arduino control board that receives button presses and sends serial commands to a PC running a python script. Meanwhile, the PC runs the games off of Pica Pic in a Web browser, using the Arduino-based buttons in place of a keyboard.